The Fluke 5500A is available to buy refurbished used or rent, usually from our UK stock. Click here to download the Fluke 5500A datasheet. DCV, ACV, DCA, ACA, R, C, T, Power & Hz. The 5500A is a revolutionary product that addresses a wide cross-section of your electrical calibration work load. It sources direct voltage and current, alternating voltage and current with multiple waveforms and harmonics, two simultaneous voltage outputs or voltage and current, and simulates power with phase control, resistance, capacitance, thermocouples and RTDs. The 5500As Oscilloscope Calibration options provide level sine wave, fast edge, time mark and amplitude signals for calibration of oscilloscopes up to 600 MHz. 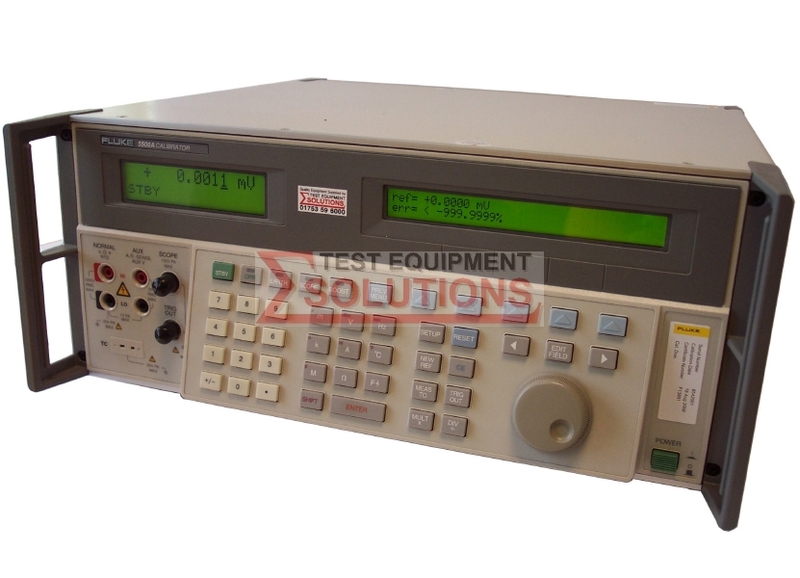 We offer the refurbished used Fluke 5500A Calibrator for sale and rental. The Fluke 5500A is fully tested and refurbished in our in-house ISO9001 calibration laboratory. We supply manuals, accessories, full warranty and a free-of-charge Certificate of Conformity. We can also provide the Fluke 5500A with a fresh calibration for a small additional charge. If you have under-utilised test equipment talk to us about trading-in or part-exchanging it towards the Fluke 5500A or other refurbished test equipment.